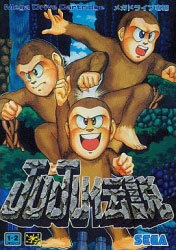 A projectile spitting and fire breathing ape makes for a versatile character to take on the imaginative platforms and bosses inspired by Buddhism and certainly harder to credit end of level adversaries. A very fine MD platformer and well sort on the system. Also known as Toki. Second hand. Manual may have gotten wet and is creased as a result with a small dog ear.